Extron Electronics is now shipping its new PoleVault Digital Systems, a family of complete, easy-to-use AV switching and control systems that integrate digital and analog video sources. Each system uses economical CATx twisted pair cable for transmitting high resolution audio and video signals, and includes network connectivity for Web-based AV resource management, monitoring, and control. 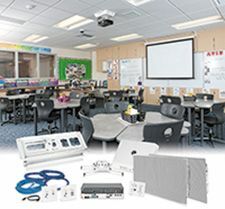 PoleVault Digital Classroom AV Systems are fully HDCP compliant with support for both HDMI and VGA sources commonly found in modern classrooms. At the heart of these systems is a switcher/amplifier that meets ENERGY STAR requirements for AV products and includes two Extron-exclusive power saving modes designed to lower energy usage and reduce operating costs. "As more laptops, Blu-ray players, document cameras, and other presentation sources include HDMI or DisplayPort digital video outputs, it is changing the AV requirements of modern classrooms," said Casey Hall, Extron vice president of sales and marketing for North America. "Our new PoleVault Digital Systems will enable school districts to install systems that meet their present and future technology requirements."